What is a popper? The jalapeno popper is a thing certainly. Is it a class of things? Is it so different that we can’t consider it simply to be an “appetizer”, an “hors d’ouever” or even a “bite”? What makes cheese-filled jalapenos deserving of the name, but not – say – bacon-wrapped water chestnuts? Sadly, this is beyond the scope of our article today. Suffice to say that if the only requirement to be a popper is that you enjoy popping them in your mouth, then Trader Joe’s Southwest Jalapeno Poppers most definitely fit the bill. Trader Joe’s has developed for us this tasty new appetizer to grace our plates at sporting events, birthday parties, themed get-togethers, or generally anytime you want people to come over and eat up all your food. The southwestern popper is a combination of white chicken meat, roasted corn, black beans, diced jalapenos, spinach and jack cheese all rolled up and melted together a meatball-sized glob of mini-Mexican dinner. This glob is more or less held together by a coating of red white and blue tortilla chip crumbs because hey, why not, Trader Joe’s probably has a ton of left over tortilla bits from their bags of Red White and Blue Tortilla chips. The result of all this are some really good, bite-sized, finger food appetizers that will be eaten up as soon as you set them out. Each popper is, essentially, just one-mouthful of chicken burrito – an idea so simple that it’s shocking Taco Bell hasn’t been doing it for years. It’s all the classic Mexican food ingredients you love (meat, cheese, beans, et al), but instead of bothering to wrap them up they’ve just been left at the bite-size level – perfect for picking up ‘twixt thumb and forefinger and, dare I say it, popping. 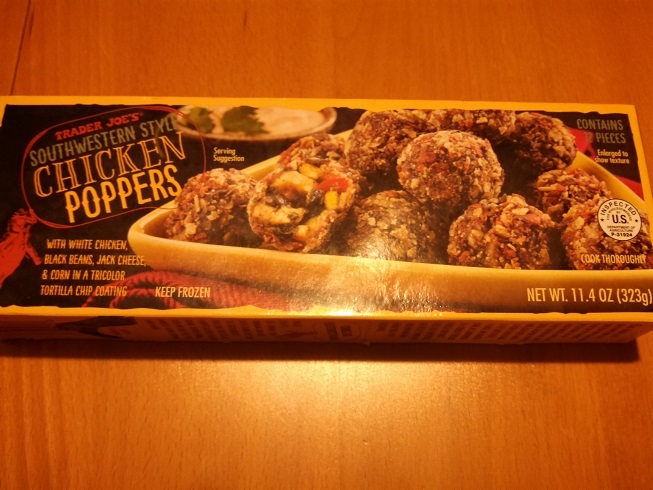 If there’s anything not to like about Trader Joe’s Southwester Style Chicken Poppers it’s that they don’t really hold together well. Look at that picture on the box again – notice that there are no toothpicks sticking out of them. That’s because a toothpick would be about as helpful for picking these up off the plate as an acetylene torch would be for picking up marshmallows. The tortilla crumb coating just doesn’t bind the contents very well at all, and even after a good long bake in the oven these poppers are still given to falling apart at the end of a fork. That means that poppers are really meant to be finger food – but for such a snackable morsel, that’s not really a big problem. Just be sure to buy a couple boxes if you plan on entertaining – they’ll go fast. Would I Recommend Them: Yup, these appetizers are both filling and tasty. Would I Buy Them Again: I might set some out for the Super Bowl party. Final Synopsis: Bite-sized burrito balls, minus the wrap. I’m just curious: from what part of the country are you sampling and writing? I’m in CT, and I feel like I’d have noticed these and tried them, but it’s not a familiar product to me. I’m gluten-free as much as I can possibly be, and these sound like a good little snack for someone trying to avoid wheat. And by the way, if I’m lucky enough to have you reading this message, is there someplace I can contact you if there’s a T.J.’s product I’d love for you to showcase? The brown rice and quinoa pasta is a bit of a revelation: it’s got a great, neutral pasta flavor but a little more heft and chew than regular spaghetti – I can’t seem to get enough of it, especially with their frozen mushroom medley with garlic. Hi Mara, thanks for all the awesome comments you’ve been leaving on the blog! I’m writing from the Great American Southwest – mostly Los Angeles, so poppers are a familiar sight to me. I’m just kind of an oblivious omnivore myself, so I don’t usually consider food from a gluten-free angle. That said, this probably would make a good snack for the gluten adverse. Thanks for responding! This blog is a terrific, fun idea. Great blog — first time here. I LOVE these but can’t seem to find them anymore. Were they discontinued? TJ’s discontinued them due to low sales. It’s a shame since we really liked them, especially if they were served with sambal mayo (1/2t sambal oelek, 2t mayo).